Let's be honest—store-bought sun-dried tomatoes tend to be a bit leathery and tough, without much flavor. They seem like a faded, desiccated memory of a tomato, rather than a fragrant, intensified taste of summer days. 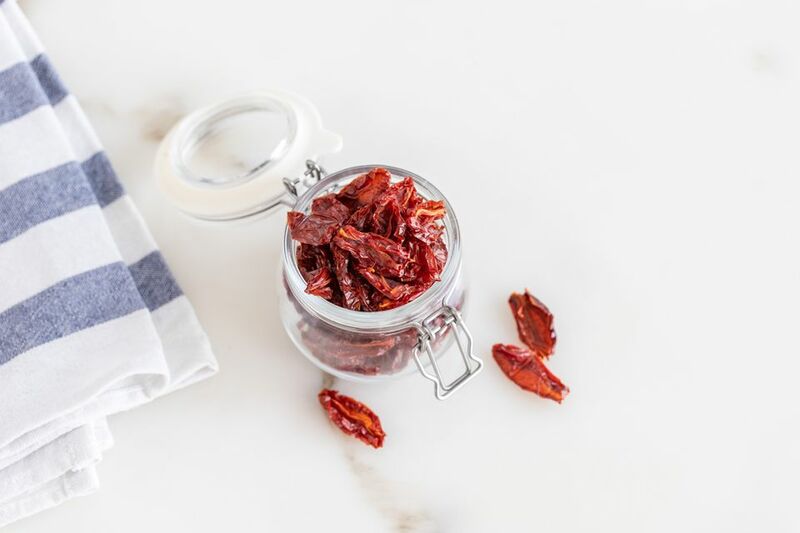 Homemade sun-dried tomatoes, on the other hand, are another thing entirely: fragrant and chewy but not tough, with complex, concentrated tomato flavor and a slight sweetness. Sun-dried tomatoes are so named because they are, of course, dried in the sun. Although this is not difficult, the trouble with making them at home is that many of us do not have the abundant outdoor space required, or the time necessary, or perhaps we lack consistent, strong sunshine, or live in highly polluted cities or bug-infested areas where drying food outdoors is not the best idea. The solution? You can easily dry them in your oven. Oblong tomatoes like San Marzano or Roma, or flavorful cherry tomatoes, work best. Once they are properly dried, they will last for many months in zipper-sealed plastic bags stored in a cool, dry place. Preheat the oven to 200 F, or the lowest setting possible. Resist the temptation to use a higher temperature to speed up the process, as then you'd be cooking the tomatoes, instead of drying them. Core the tomatoes, and cut them in half lengthwise (from stem end to tip). Squeeze each half gently over a bowl to remove excess liquid and seeds. Make a small slit with the tip of a sharp paring knife in the back (skin-side) of each tomato half to help them dry. Place a drying rack on an aluminum foil-lined baking sheet, and arrange the tomatoes, cut-side up, in a single layer on the rack. Make sure there is a bit of space around each tomato and that they're not touching so they can dry evenly. Lightly sprinkle the tomatoes with salt. Place baking sheet in the oven and leave until the tomatoes are dehydrated and a bit leathery, but not hard, brittle, or crispy. Check them every hour during drying. Depending on your tomatoes and oven, this can take anywhere from 6 to 12 hours. When finished, they should still be somewhat chewy and flexible. Remove from the oven, and let cool. Use in your choice of salads, pasta, or as a pizza topping. Drying is a traditional Italian way of preserving an abundance of ripe summer tomatoes so that they can be enjoyed throughout the rest of the year; this is particularly popular in the southern Italian regions of Calabria and Puglia. Italian cooks fill sheet pans with halved tomatoes and place them on the roof of their houses to dry for several days in the blazing-hot Pugliese sun. When you're ready to use the oven-dried tomatoes, you can incorporate them into any recipe that calls for sun-dried tomatoes, or try the traditional method of marinating them in a jar full of olive oil and spices. They are great as pizza toppings or in pasta, in salads, or simply as part of an antipasto platter.